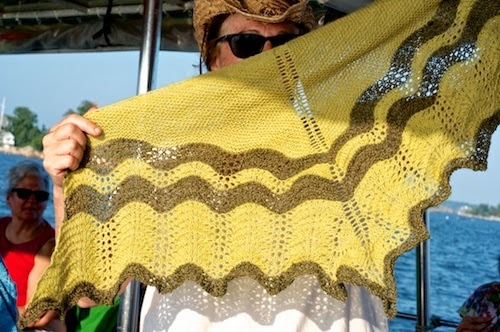 What better place than the 2nd Non-Annual Thimble Islands Knitting Boat Trip to show my finished Wave on Wave Shawl? * More about my shawl below. Let's get right to the the knitting cruise, shall we? Cap'n Bob can now say that his vessel not only flies the pirate flag (local tradition) but had yarn handspun on it, thanks to wonderful Dayna of MadWool, center column, 2nd from top. Also, in the colorful hair department, you can see Katy knitting a Pop Spots shawl that totally matches her black & fuschia/purple 'do, on the right.. Despite the dock sign, we were on the Volsunga. Not the Sea Mist. Stony Creek dock sharing. I love my knitting community- and special shout out to Linda- (photo upper left), June & Julia of Knit New Haven , whose open table policy sets the vibe for this kind of adventure. It was lovely- cool sea breeze on a warm day, great company, lots of food & drink & spying into the island houses, some knitting. I love putting together things like this. 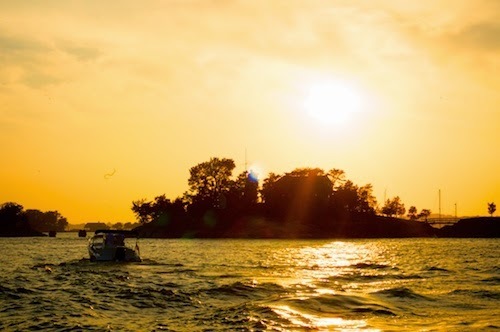 Want a cruise in your neck of the woods? I'll do it . 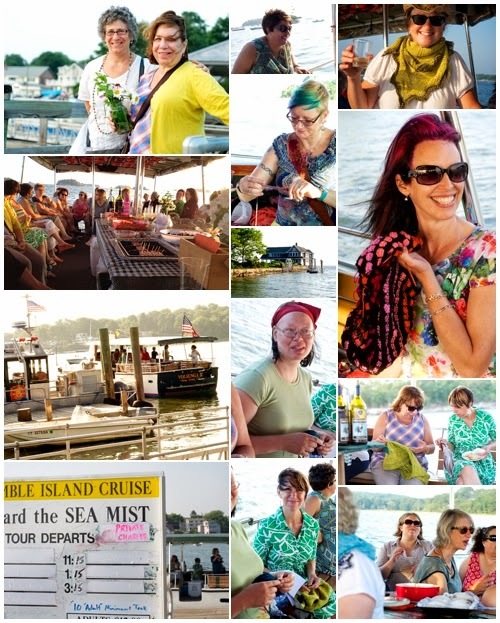 Now there's a niche-- knitting cruise events coordinator. But, why not, you know my policy: " is it illegal? No? I'll try it!" * So about that shawlette. The lighter green yarn was from Maine in 2012 when I visited Swan's Island "seconds" bins. I love the color, it's like spring in Maine. The darker green yarn was a putty colored beige when my son brought it to me from Peru. A very botched dying job on my part, at Ellen Mason's mentored dye tent at Fiber College left it, as she generously put it, "sad", so she took it home and sent it to me in this mossy green shade-also like the Maine woods. 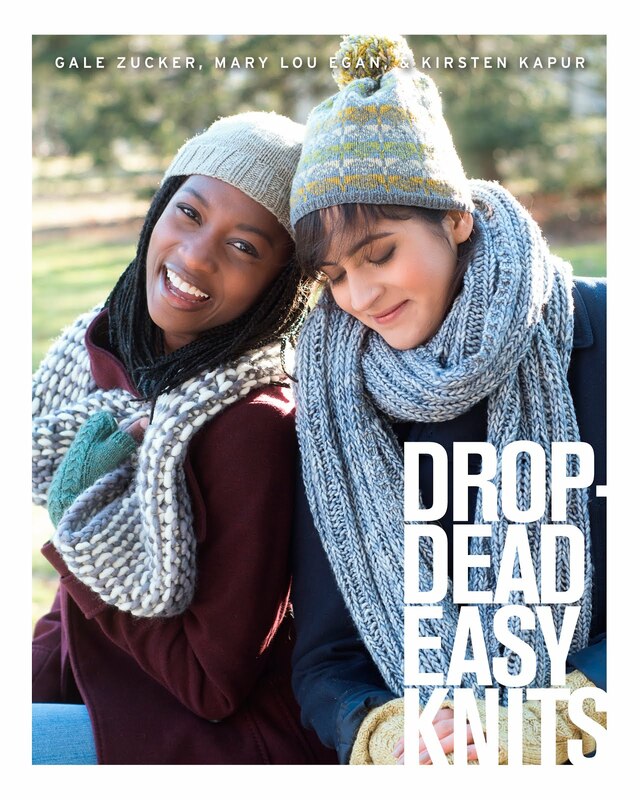 I had to knit them into the same piece, right? Nice pattern, though not big on details. Still, it's a fun little project, written for a color changing yarn but easy enough to stripe it yourself. The image of me modeling it in the upper right goes against everything I'd teach: don't wear a bright white summer shirt and straw hat to model a wooly neck accessory, don't shoot on a rolling ship.. but thanks to Linda Young for doing an awesome job despite the challenges.I am not an easy subject. Photo credit to Janet Hager for the view of the snack table and knitters, 2nd from the top on left. I was too busy having fun and sipping Prosecco to get that view. Next up: need to tell you about teaching at Gathering of Stitches in Portland Maine. More to come!